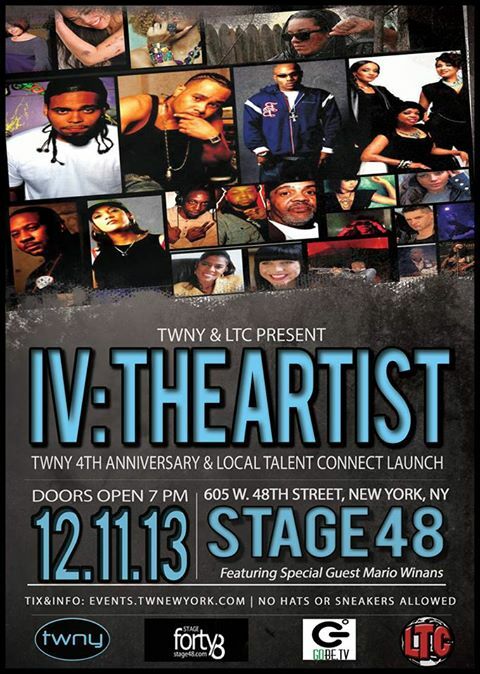 Branding and production agency, Tranquil Water NY, Inc. (TWNY) in association with global arts network, Local Talent Connect (LTC) is pleased to announce IV: the Artist, a merging of two great events: the celebration of TWNY’s 4th anniversary (originally slated for Dec 1st) and Local Talent Connect’s “A Red Carpet Christmas” (a holiday event by the platform that aims to connect artists from all over the world). Featuring a star studded red carpet, and live performances: the date is now, Wednesday, December 11th at 7:00PM, and you’re invited to take part at legendary Hells Kitchen concert venue, Stage 48, 605 West 48th ST, NY, NY 10036. Together the two companies present IV: The Artist, a star studded event featuring radio’s Steph Lova & FUSE TV Producer June Archer as hosts, with performances by Grammy Nominated R&B Artist Mario Winans, R&B songstresses Allure, son of Big Pun Chris Rivers, jazz great Shareef Clayton with hip hop pioneer DJ Hollywood, Brand Nubian’s DJ Alamo, DJ Dyno of Voyager Movements and DJ Marvilous on the 1s and 2s. Additional performances by up and coming superstars 2Cann, Melissa B., Natalia Segura, Soliris, Jerra Blues Band, Kola, Mia LJ, dance troupe The MTA Mass Transit Artists, and fashion show by Toriola Inc. Red Carpet hosted by AmeliaisMore and On Deck With Lucy. Co-hosts include Dyesha Hicks, Christine Vega and Spencer Humphries. This December, branding and production agency Tranquil Water NY Inc. will celebrate its 4th Anniversary. Founded on the birthday of its CEO Omar Ortiz, the full service firm specializes in digital strategy as well as building brand capital for artists, entrepreneurs and products. Founded in 2012 by CEO Todd Wharton, Local Talent Connect is a new global network for artists of all kinds. With just over a year since its inception, Local Talent Connect is approaching 5,000 followers strong on existing social media platforms. TICKETS: Tickets are now on sale and can be purchased here. A portion of each ticket sale will be donated to the Adam Yauch Foundation, named after Beastie Boys legend Adam “MCA” Yauch.